Continental Drift grew out of my recording The Continuous Preaching Blues album on the Italian Appaloosa label, a collaborative split record with Ian Anderson, the guitarist singer not the flute player from Jethro Tull. As a result of that record i was offered a live radio gig on the Paul Jones Blues Show but I didnt have a band. I had used Tim Hill playing saxophone on it and we called in local Reading musicians we were working with in various other projects. 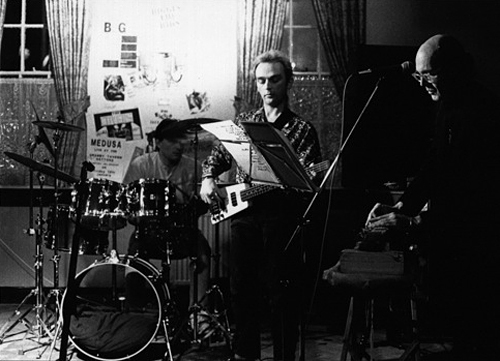 Pat Thomas on keyboards, Garry Jones on electric bass and Simon Price for drums – all local Reading musicians apart from Pat who was from Oxford. Myself, Pat and Tim, with dj Neil palmer were Mayhem Quartet; Me, Tim and Garry with the addition of Paul Burwell were Beating Time; Tim and I were Trystero System. We rehearsed a few blues tunes and Continental Drift was born. In 1989 when Jean Rochard asked me to record two pieces for the compilation c.d. 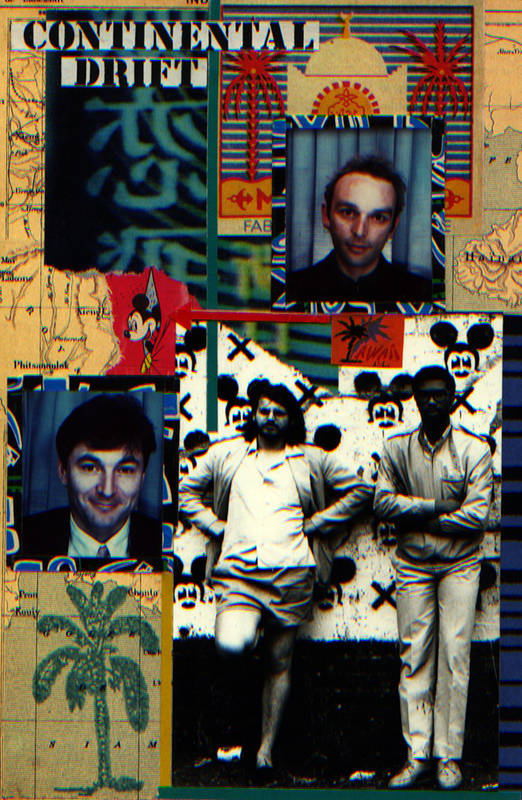 ‘Spirou’ for his Nato label which was to be a double album of soundtracks to illustrate different editions of a series of French comics I composed a graphic score for ‘Jerry Contra KKK’ which resembled a comic itself – each window had a set of simple instructions or a suggestion written inside but no actual notation. I assembled the same group to play what amounted to a piece of music for a cartoon, moving through a variety of musical genres and styles but all improvised. It is one of my favourite pieces on record. 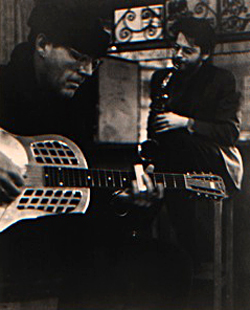 We never played more gigs together as Continental Drift until in 1990 Norman Hewitt of the Blues To Bop festival in Lugano/Switzerland offered me a concert. I called up Continental Drift and we became a blues band again, but with Peter Beresford on keyboards (Pat couldnt make it) and with improvising tendencies. We were totally unlike any of the other bands that played the festival. We were invited back the following year. This time I augmented the band with two keyboards (Pat and Pete), added Geoff Hawkins and Tim on Saxophones and called in Viv Corringham and Mary Genis as vocalists and invited Cyril Lefebvre on slide guitar for a special Hawaiian Blues section. With Garry Jones on bass and Simon price on drums we were ten on stage at one point. Continental Drift went into retirement again until 1994 when once again Jean Rochard offered to record my Island Songs c.d. for his Nato label. I began the project recording two pieces, ‘Money All Gone’ and ‘New Hard Times’, with the original band plus Geoff Hawkins on tenor sax, at Lansdown Studios in London. I finished it at Acousti Studio in Paris. Our crowning glory was an appearance at the Banlieues Bleues Jazz festival. We were support for B.B.King and the backing band for Chuck Berry. Our set with B.B.King was the scariest moment of my musical life do far. B.B.King had just come from a tour with U2 and the place was packed. It was so packed that the promoters were worried. They hadn’t expected so many. We took the stage and about a third into our set we started playing Sleepwalk the old Santo and Johnny instrumental hit. The crowd went berserk and started throwing plastic water bottles at us. We continued to the end of the tune and then fled. All except Pat Thomas who hadn’t realised what was happening sat at his piano in the back of the stage. He looked up and was alone with a stage knee deep in water bottles – some full. Chuck Berry was no problem after that. That was the last time we played together as Continental Drift. Garry Jones died in 2007. This page is dedicated to him. Go to http://www.garryjones23.com for more on Garry and his music.